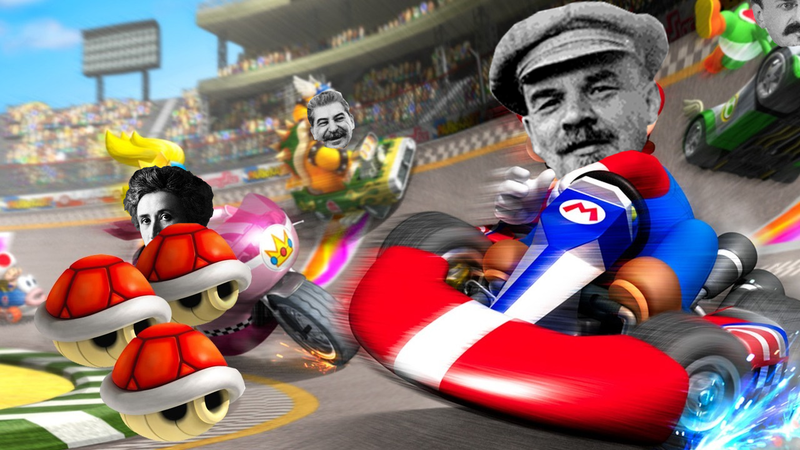 Once again, Nintendo and its creations eerily mirror the Soviet Union in a number of ways, this time with Mario Kart. Mario Kart is a game designed for the whole family, pitting popular characters from the Mario and greater Nintendo universe against each other in a go-kart race to the finish line with speed boosts, sky-soaring jumps, and infuriating special abilities. One of the ways that Nintendo have made the Mario Kart franchise universally accessible is through a number of balancing mechanics that keep every player continually challenged in a fun way and makes sure that, even if you’re lagging behind, you’re afforded opportunities that keep the race equally competitive. And I can’t help but see parallels between these mechanics and a Soviet five-year plan, so let’s look into this some more. When playing Mario Kart with AI, a patented mechanic is implemented: rubber-banding. Introduced in Mario Kart 64, the game will either give CPU racers who lag too far behind you an abnormal speed boost as an opportunity to catch up with you, or will hinder the performance of your vehicle for the same effect. While this may initially seem unfairly-punishing to players who put the extra work in to make it to first place, in reality it keeps the experience consistently challenging, and makes sure you’re always on your toes. This mirrors the Soviet Union’s five-year plans, wherein every facet of economic development including agriculture, transportation, health and education, was carefully monitored and controlled to maintain an equal level of growth. The Blue Shell is perhaps the most infamous of Mario Kart’s item roster, introduced in the 1996/97 release Mario Kart 64. It’s similar in function to the Red Shell, firing off and homing in on the player ahead of them to stall them for a few seconds and giving you an advantage. Only, the Blue Shell specifically targets the player in first place. It, and other powerful items, become more likely pick-ups the further you are from first place, as a means of giving players performing more poorly a chance to get back into the fray. This aspect of Mario Kart also ties into the five-year plan system. During each five-year period, while every aspect of the economy was maintained at roughly the same level, special focus would be given to a specific industry throughout the plan in order to bolster it depending on the needs of the state. Mario Kart’s balancing in these two aspects were always intended to make races an even playing field regardless of skill, experience and accessibility, because at the end of the day, Nintendo wanted to make something that anyone can enjoy: that sells. But, varying from iteration to iteration of the franchise, it’s always been ragged on by some who feel that it makes the game boring, and that it doesn’t reward players who put a lot of effort into being really good at beating their counterparts. Similarly, many Capitalist thinkers who praise the free market as a bastion of diversity in options and that rewards the hard worker over what they’d call the “freeloader,” don’t understand that unregulated economy breeds systematic inequality, and harms the little guy who might not have the resources or opportunities afforded to those better-off, and thus will suffer under such a system. What do you all think? I suspect, especially given Nintendo’s track record of being comparable to the Soviet Union, that this is pretty conclusive evidence of the Soviet Union inspiring a lot of what the Japanese company did and how they behaved, especially back in the day.